LANCASTER – Calling all badge carrying personnel! The American Red Cross would like you to come out and donate blood at the annual Battle of the Badges blood drive. Hosted locally by American Medical Response, the Battle of the Badges blood drive takes place from 7 a.m. to 7 p.m. Monday, Jan. 27, at the AMR office at 1055 West Avenue J in Lancaster. The annual Battle of Badges blood drive is an opportunity for law enforcement, fire departments and emergency medical services to positively impact the community by participating in a friendly competition to see who can donate the most blood. The Battle of the Badges began in 2007 in Southern California. The initiative is now the nation’s largest and most successful law-enforcement blood drive. This year, state, county and federal badge-carrying agencies will go head-to-head to see which can donate the most pints of blood through the American Red Cross. While this initiative is themed and geared specifically toward the law enforcement community, the general public is strongly encouraged to participate. Blood donations dramatically decline during the holiday season, when schools are on break and many people go on vacation. The life-saving blood collected through Battle of the Badges helps alleviate the strain on the depleted blood reserves and highlights local law enforcement for going beyond the call of duty. 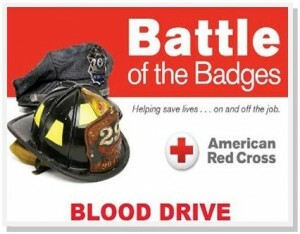 To make an appointment for Monday’s Battle of the Badges blood drive, call Chana Alexander at 661-400-9637. 5 comments for "‘Battle of the Badges’ blood drive Monday"
Can diabetics donate blood. ? I’m a security officer for Inter-con Security Systems, and I was wondering if the American Red Cross would be willing to do the same (Battle of the Badges but instead Battle of the Security, well something like that) for other security companies that are around the A.V. Area like Lantz Security, Pinkerton, Securitas, G4S Secure Solutions, Inter-con Security, etc, that should motivate more donations as well…just an idea. :-) have a nice day and thank u for ur time. Contact me and I can help you with that! I am the Red Cross Rep for the AV!